Before my cataract surgery, I was hard at work on samples for my week long class at the Grunewald Guild. I need not only completed work, but also some pieces that are partially finished so that I may demonstrate the process for students. The class this summer is called Fabric Collage in 3-D, and we will focus on structures, containers, and whatever the students may design. This afternoon, I set my camera up for auto-focus, since my eyes are not quite trustworthy yet, and took pictures of three pieces that are, literally, in pieces. The first is one side of what will be a five-sided vase. The blue fabric was dyed in the microwave earlier this year. I found the ceramic octopus at Shipwreck Beads. 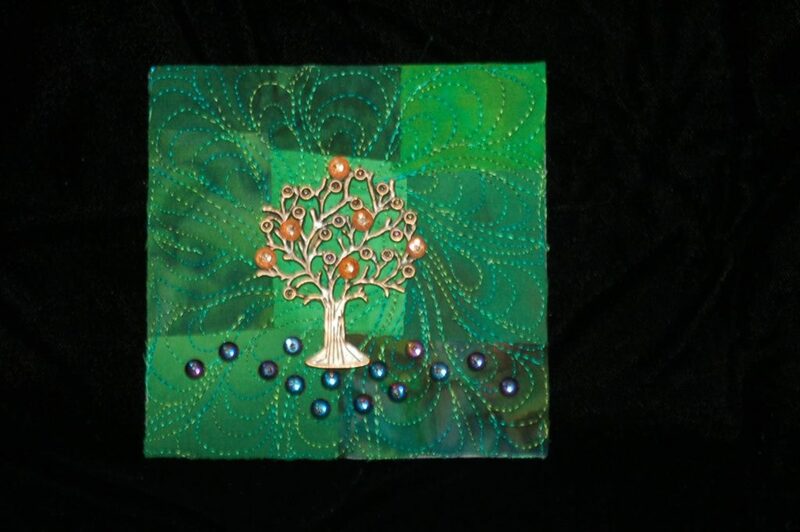 The second will be the top of a box, and is collaged of an assortment of fabrics and embellished with a metal tree charm and glass beads. The third will be the back wall of a small shrine. 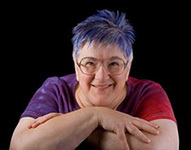 The face was created by Diane Briegleb. The bead embroidery section was done on a separate piece of Timtex and then mounted on the fabric collage background. I am very much looking forward to being able to see well enough to thread a needle again. The second surgery is next week, so things are moving along in the right direction. Be well, my little chickadees! No pictures today. I can’t see well enough to go searching for them. You see, I had cataract surgery on Tuesday morning on my left eye. I’ll have the right eye done on the 23rd. I went to the drug store yesterday to get some reading glasses, but they don’t really help much since I need one level in one eye and a different level in the other eye, and they don’t sell them that way. Oh well. All should be back to semi-normal by the end of the month. I hear from my tech guru, Christina, that my blog posts will now be going out to you every week, if I have, in fact, posted anything. I’ll try to do better next week and find some photos for you. Prior to the surgery, I was working diligently on some samples for my class this summer at the Grunewald Guild. If I set my camera up for auto-focus, perhaps I can get some pictures of that work to post. Here in the Pacific NorthWet, we expect spring to be chilly and drizzly. But for the next few days, at least, we are expecting warmer than normal temperatures and clear blue skies. This is a great opportunity to get out in the yard, take a long walk, visit the zoo – anything outdoors. Because we know in our hearts that the rain will return. At the top of this blog is a row of photos of my work. On the far right side is a large neckpiece called “Spring Rain”. For me, one of the surest signs that spring is on the way is the appearance of the lowly crocus. They can run the gamut of purples, white and yellows, and are cheerful little hints of good things to come. 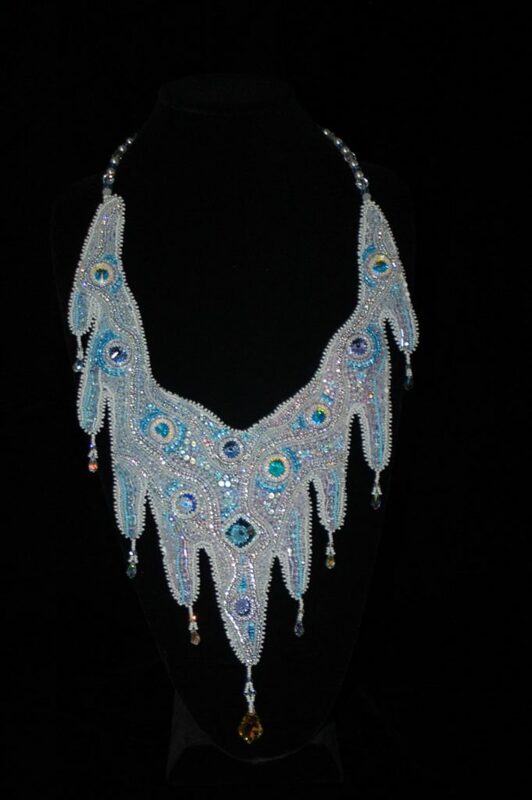 They are popping up all over the place, and they inspired the color choices for that neckpiece. 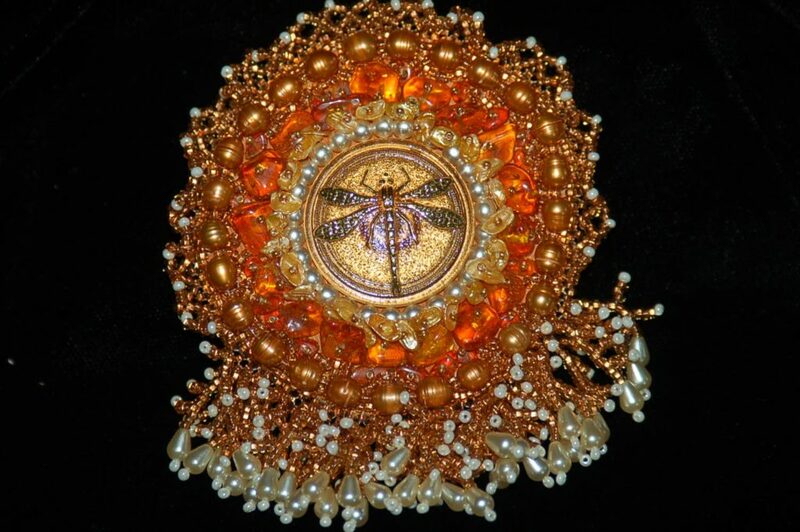 Meanwhile, while digging around in the basement (aka studio) I ran into a box of beaded pieces that were finished, but had never been photographed. Not for a moment would I profess to being a good product photographer (Van was great at it and did all my photography until he got too sick to handle it). And sometime down the road, I hope to get some lessons from my brother about set up and lighting. But for now, here are a few not-so-great photos from the not-quite-ready-for-prime-time box. That’s all for now, my little chickadees. With any luck at all, everything will work so that you received this in your email in-box. Be well, create beauty, and enjoy springtime (whenever it gets to you)! Recently, the Pacific Northwest suffered one of the worst snow events in recent memory. I heard that they had to go back to 1949 to find a worse storm on record. Now I understand that we don’t get the winter weather that is found in other parts of the country, and believe me, I sympathize. But the truth of the matter is, Seattle and environs are just not prepared for serious winter weather because we simply don’t get it very often. There are lots of hills around here, and lots of transplants from other places who don’t know how to deal with our particular mix of wet, heavy snow and underlying ice. The best approach is to get everyone indoors, and stay there until things start to get better. Which is what we did. My approach was to watch some old movies and binge-watch some favorite old TV shows while catching up on some handwork. One of the projects I picked up to finish had actually been hanging around since 2016. I know this because at some point in the construction, I actually signed and dated it with my sewing machine. This is the latest in my Treasure Box series, and is about 6″ square. 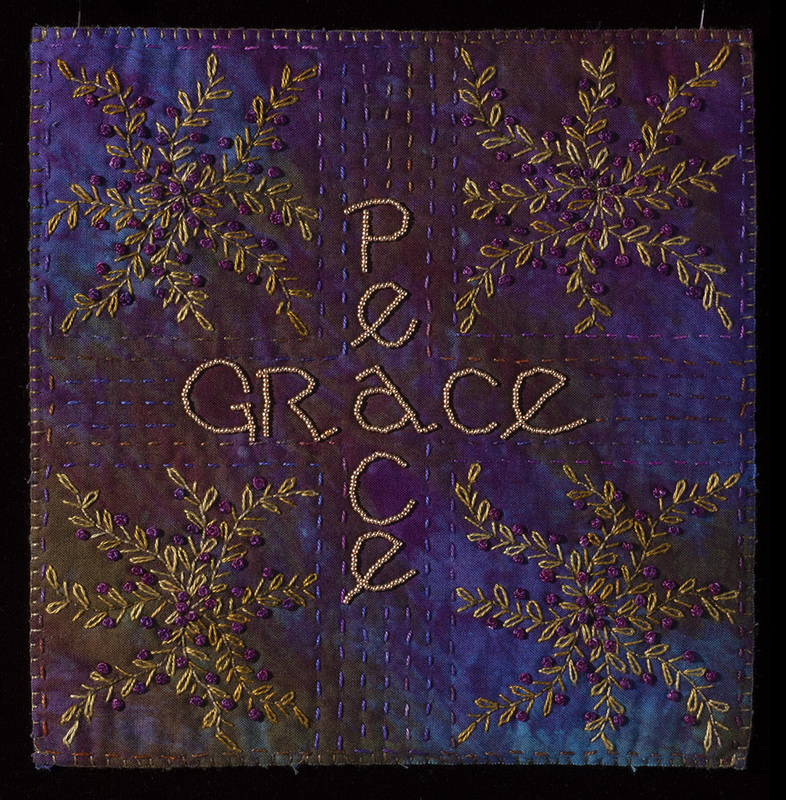 I love the color scheme of the fabric collage, which was exuberantly free motion stitched. 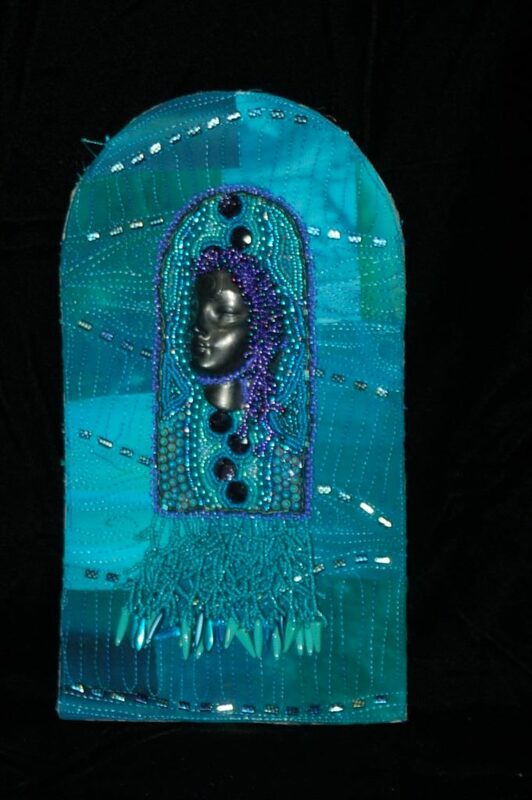 The top was beaded by hand, and the wonderful ceramic face is by Diane Briegleb. I worked on a few other projects during the snow, but none of them got finished except this one. By the way, the signature is on the bottom of the box where no one will see it unless they pick it up and look. Winter isn’t over yet, so stay warm, dry, safe, and healthy, my little chickadees! That’s all for now, my little chickadees. Be well, stay warm, and do a little something creative every day! A few days ago, I received a lovely email from someone who had seen one of my exhibits at the Latimer Quilt and Textile Center in Tillamook, Oregon. 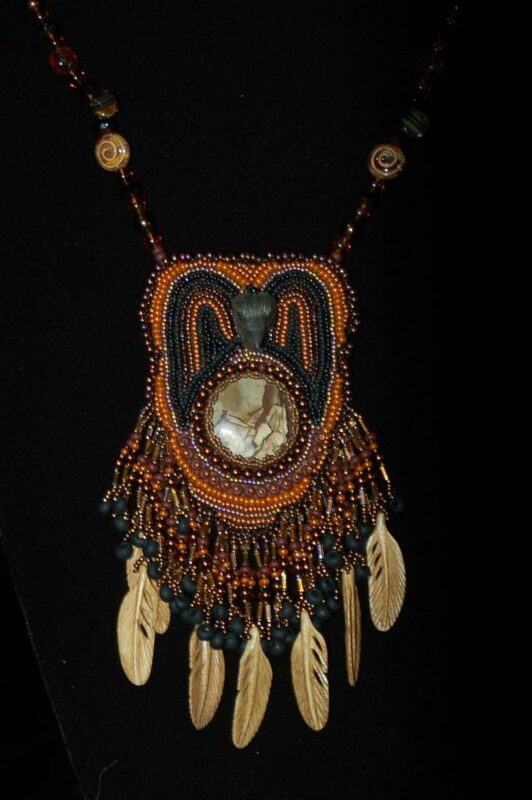 One of the pieces in the exhibit was called “Everyone Has A Story” and was comprised of a bare manzanita branch covered with a lot of very small beaded dolls, ranging in length from 1-1/4″ to 3-1/2″. The artwork moved this viewer to write a poem about it, which he wrote to share with me after he rediscovered it and typed it up. I asked his permission to share it with you here, and he has graciously agreed. Thank you, Ryan, for sharing your poem and allowing me to use it here. I am always delighted to hear what people think about my work, even if their interpretation differs from mine or they just flat out don’t care for it. Art, like beauty, is in the eye of the beholder, and everyone is entitled to an opinion. And so, my little chickadees, if you have seen something that moves you or inspires you, consider telling the artist about your reaction to their work. Even though we might not really like to hear that you think it belonged in the rubbish bin, at least we will know that you thought about it – that it moved you in some way. And for some of us, it’s time to take stock of the year just past and think about the year to come. I don’t make resolutions, but I do list some goals for the year. Some involve studio work, learning more about this thing called a blog, making smarter decisions in some areas, doing a little traveling, and trying some new things. But most of all, to focus on things about which I can actually make a difference – to show more compassion and kindness, to be generous to those who need a wee bit of help, to stop feeling guilty about taking time for introspection, to find a more peaceful way to go about my days. And so, my wish for you, my little chickadees, is to find peace and hope in the new year, and a way to reach some of your own goals. Author larkin_wp_artPosted on January 6, 2019 Leave a comment on On The Twelfth Day of Christmas . . .
Several weeks ago, on the QuiltArt discussion list, ideas for a group challenge were floated and commented on. One that caught my attention was a challenge based on words that had multiple and very different meanings. One offering was the word “resist”. In the present time, that word has come to represent a political movement. But it also refers to a substance used to block the flow of paint/ink/dye on paper or fabric. I have no idea if the proposal ever gained any traction, as most of the discussion takes place on Facebook, in which I do not participate. But the idea of “resist” as a starting point stuck with me. If one resists something, it could be said that one opposes it. Which led me to thinking about opposites. For many years, I have been interested in the historical and contemporary meanings ascribed to colors. I have put together quite the list, and it has been put to use as a point of inspiration or refinement of an idea in the creation of my artwork. It has not been my practice to produce blatantly political work, but I liked the idea of using color as representative placeholders. To the viewer not well versed in color symbolism, it would just be another modestly attractive piece to hang on the wall. The list is broken into positive and negative attributes, and I remembered that the color yellow has some negative characteristics that might serve as a starting place: deceit, instability, betrayal, covetousness, treachery. Grabbing my trusty color wheel, I found purple directly across the way, and checked the positive attributes list: dignity, leadership, truth, intelligence, self-control. Now, granted, these are just a few entries on each list, but it set up a nice juxtaposition. I have a plan forming, and hope to get to the studio soon to put it into action. Whether the challenge ever happens in the QuiltArt group, it led me in an interesting direction. Pictures to follow, as soon as I have something to show. However you choose to celebrate, my little chickadees, I wish you peace, good health, and all the blessings of the season. 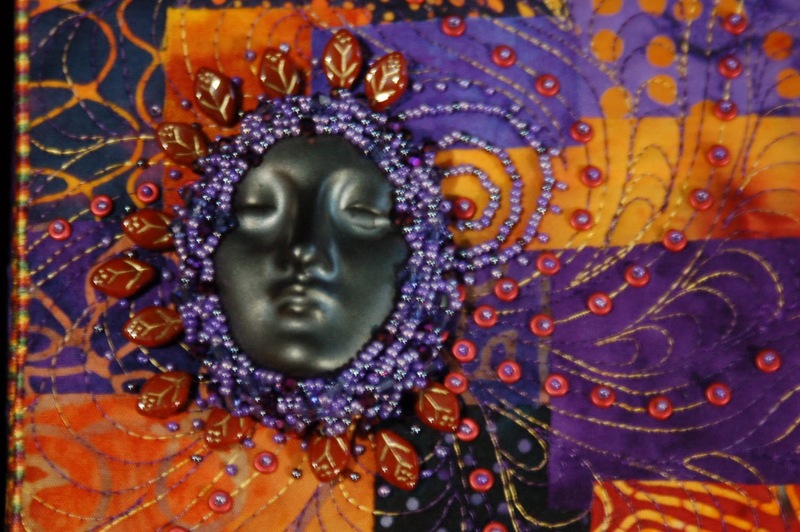 there was a mixed media textile artist who was married to her most dearly beloved husband, Van, who was also her photographer, webmaster, publicist, and wizard in the kitchen. She spent her time making things and traveling around teaching people how to do what she did. He spent his time helping others with their various and assorted computer and publishing issues, and generally keeping all the balls in the air. Never a truly healthy person, he fell victim to cancer, and the next four years were spent consulting with a long list of medical personnel, enduring various treatments, and generally living on hope for a cure. She left her world of art and teaching to take care of her most dearly beloved. In the midst of this stressful time, they lost their home due to their inability to work much, and became homeless. A month before his demise, Van’s computer empire crashed. He was far too ill to do anything about it, and she lost her email, website, blog, photography, database – everything. As it turned out, he also neglected to leave behind a list of his passwords, so no one else could get in and do anything about it. But a kindly hacker tried, and some things were retrieved (mostly older work), until one day the whole mess caught fire and what was left was well and truly gone. Van died on June 28, 2017, so I can’t say that we all lived happily ever after, but a year+ has passed and I can say that a few steps in the direction of the studio have taken place. I have a couple of lectures and a week of teaching on the books, and I miss him every day. While we were homeless, I did manage to create a small series with the theme of “Peace”, which I desperately needed at the time. They all have words of peace, and those words are the titles. That’s all for now, my little chickadees. Be happy, create wildly, love extravagantly! Author larkin_wp_artPosted on October 17, 2018 4 Comments on Once Upon A Time . . . Welcome to my LarkinArt Blog! Please excuse me while I am updating my website. Check back soon! Author larkin_wp_artPosted on September 12, 2018 September 13, 2018 7 Comments on Welcome to my LarkinArt Blog!